LOVE this photo !!! ANSS for absolute sure !!! 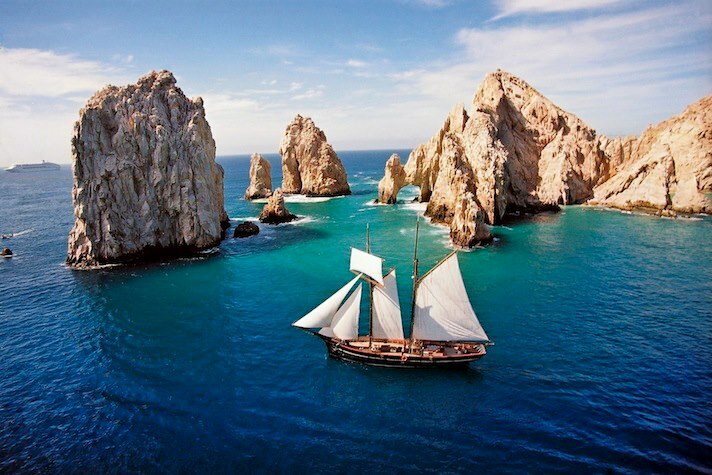 And, wish I were sailing at that particular location (right now) .... MaryLu, what think you ... could we "possibly" sail the Redemption to this spot ??? Beautiful ! And, thanks for sharing. Beautiful photo! The water is gorgeous! Simply Beautiful! I love the bright hue of the sea blue or turquoise. Ooooooo ... I love this photo! Gorgeous. Mysterious. Thanks for the view! Very pretty! Is that a cruise ship in the background? Good idea, Brenda! This can be one of our shore leave spots during the break! The color of the water in the Caribbean is actually this color.. .I was amazed when I went to Jamaica last year. So pretty! Oh my.. I didn't see the cruise ship in the background!! LOL. Doesn't seem to fit with the tall ship, does it? Thanks for dropping by, ladies! Haha, nope. I almost didn't see it either. But all the sudden I was like, "What the?"